Motorcycle, Scooter and ATV Filters. A motorcycle combustion engine requires a precise mix of fuel and air to perform at its best, so making sure the motorcycle can breathe freely is an important part of motorcycle maintenance. Motorcycle air filters may be made of paper or of foam. A good brand, such as HiFlo air filters, will block dirt and large particles which could damage the engine, while still maintaining a good air flow. 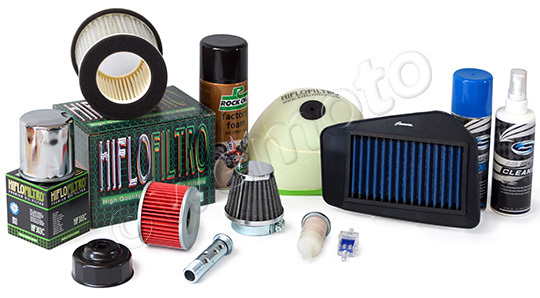 Foam filters will require periodic maintenance with Motorcycle Air Filter Cleaner and Motorcycle Air Filter Oil. Your handbook will tell you recommended cleaning and replacement intervals, although in certain cases (such as particularly sandy conditions) your air filter will need replacing more frequently. If it looks dirty, it needs changing. A dirty air filter can cause the ratio of fuel to air to be too rich - replacing the filter will restore the ratio, maintaining optimal fuel consumption and power. Conical air filters clamp straight on to the carburettor, removing the need for an air box and in many cases improving the air flow compared to the original filter. Conical air filters can be washed and reused, rather than thrown away and replaced. Simota and K&N filters utilize oiled fibre sheets held in place with a mesh, which allows maximum air flow while still protecting the engine. In many applications, with appropriate jet or mapping changes are made to match the increased air flow, this can result in a performance boost. The filter material can be washed and then reoiled with a Simota or K&N air filter recharge kit, rather than being replaced. Oil filters should be replaced whenever a motorcycle or scooter has an oil change. Your handbook will tell you the recommended service intervals, although on some smaller engines with small oil capacity, some owners do it more frequently than suggested. Wemoto stock HiFlo Filtro oil filters for motorcycles, scooters and ATVs. These high quality oil filters for motorcycles are the first oil filters to ever have TUV approval in HiFlo Filtro's quest to make the best motorcycle oil filters. Simota have developed a stainless steel reusable oil filter. As a filter material, stainless steel mesh has more consistant filtration while also maintaining a flow rate of almost seven times the rate of most paper filters, so even cold oil can be filtered without difficulty. The stainless steel filter is washable and reusable, rather than being replaced at every oil change. To remove a spin-on motorcycle oil filter, an oil filter wrench is required. The cup type oil filter wrench comes in one size and engages the knurling at the end of the filter, allowing it to be turned. Wemoto also sells strap type oil filter wrenches which can be adjusted for different sizes of filter. Motorcycle fuel filters block particles and impurities from the engine, protecting the motorcycle engine from abrasive particles and maintaining fuel efficiency. As with other types of filter, there is no need to cross reference part numbers or have a filter application guide, as Wemoto list all filters to the motorcycle, quad or scooter that they fit. Find them using the drop downs at the top. Wemoto stocks filters that cover all major European and Japanese manufacturers including Honda, Yamaha, Aprilia, Triumph, Kawasaki, Suzuki, and many more. To find a filter for your motorcycle, use our search at the top of the page.